Are you planning an important business transition? Zippy Shell can help! Moving between business spaces can be a frustrating and nerve-wracking experience, especially if you want to stay open as much as possible during the move. That’s why Zippy Shell specializes in corporate relocation services with storage and moving containers that are ideal for making your move as easy as it can be. Take a look at why companies are choosing Zippy Shell to make their relocation painless. Zippy Shell has partnered with Worldwide ERC, the Self Storage Association, and ISS (Inside Self-Storage). Being a part of these organizations means that we are held to high standards of quality, professionalism, honesty and service options. It’s how you know you can trust a company to help pack, protect and deliver important business equipment on time. This is just one of the reasons that Mobility Magazine recently recognized us as one of the most innovative relocation companies in the business. Zippy Shell focuses on flat fees, so you don’t have to worry about mounting expenses during your move. Do you need to store some items for longer periods of time during your transition? Our monthly storage rates are also flat fees, so it’s easy to plan and create your budget confidently. All of our containers have built-in security to make sure that your important items stay safe and protected during your relocation. You don’t have to worry about storing valuable equipment or sensitive information in our containers, even if you have to leave them overnight or through the weekend. Our containers are also weatherproof, so don’t let the forecast interrupt your plans! Some companies may have to store and move items that are particularly sensitive to temperature. That’s why we provide climate-controlled storage for extra protection to ensure that all of your items will not be in danger. 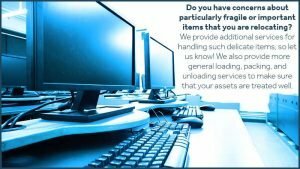 Do you have concerns about particularly fragile or important items that you are relocating? We provide additional services for handling such delicate items, so let us know! We also provide more general loading, packing, and unloading services to make sure that your assets are treated well. Our customer care team is standing by to answer any questions you have about our services or how our containers work. Have a concern during the middle of your transition? Don’t hesitate to give us a call and let us know what you’re thinking. Ready to start planning your office’s relocation? Check out more information about how Zippy Shell works and fill out a quick form for a free quote!